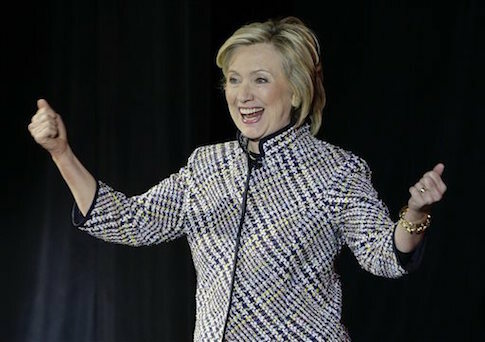 Hillary Clinton is attending a fundraiser Wednesday with longtime Clinton donors whose daughter was appointed to an ambassadorship and has since been hired as a senior adviser to a Clinton-tied group. Clinton is slated to attend the Nov. 4 fundraiser at the home of real estate mogul Angelo Tsakopoulos that will collect $2,700 per head for the Democratic hopeful. Tsakopoulos, who was invited to stay in the Lincoln Bedroom during Bill Clinton's presidency, has long been a Clinton donor, contributing between $50,000 and $100,000 to the Clinton Foundation while giving thousands more to Clinton’s political campaigns. Tsakopoulos’ daughter, Eleni Kounalakis, will also be in attendance at the fundraiser. Kounalakis is a major Clinton supporter as well, having raised more than $1 million for Hillary’s first presidential campaign. Kounalakis was later appointed as U.S. Ambassador to Hungary by President Obama in 2010 and sworn into office by then-Secretary of State Clinton. Prior to the appointment, she served as president of AKT Development, of which her father is founder and president. In August 2010, Kounalakis wrote an email to Clinton aide Cheryl Mills thanking her for her role in helping her in her career. Kounalakis left the State Department just four months after Clinton resigned as Secretary of State and was hired as a senior adviser to the Clinton-tied Albright Stonebridge Group, which is headed by former Bill Clinton advisor Sandy Berger. In 1997, Berger paid a $23,000 penalty to settle conflict-of-interest allegations and was later found to have Hillary’s personal email address as she was at the State Department, writing to her on issues concerning Israel and Pakistan. In 2015, Kounalakis continued her political activism in a number of articles praising Clinton that were published at outlets such as CNN and Washington Monthly. The CNN article, titled, "Hillary Clinton revived America's reputation in world," made no mention of the major contributions from her family to the Clinton’s throughout the years. Kounalakis wrote another article on Clinton for Washington Monthly, of which her husband is president. Earlier this year, Kounalakis participated in a media training session run by Clinton operative David Brock with the intention of creating a pro-Clinton "echo chamber." A similar appointment was made during Clinton’s tenure at the State Department. Raj Fernando, a high-frequency stock trader who gave vast amounts of money to Clinton initiatives, was later appointed to an international security board at which none of the others members "could figure out who he was or why he was there." Prior to his appointment at the State Department, Fernando gave between $100,000 and $250,000 to the William J. Clinton Foundation. The high-frequency stock trader has given anywhere between $1 million and $5 million to the Clinton Foundation as of November 2015. Fernando has also provided a boost to Clinton’s current campaign, having raised more than $450,000 earlier this year. This entry was posted in Politics and tagged 2016 Election, Bill Clinton, Clinton Foundation, CNN, Fundraiser, Hillary Clinton, State Department. Bookmark the permalink.